A profile of Chrishaldane.co.uk was found on the social network Twitter. The web server with the IP-address 72.10.53.4 used by Chrishaldane.co.uk is owned by Media Temple and is located in Culver City, USA. This web server runs a few other websites, mostly in the english language. 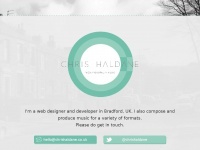 The websites of Chrishaldane.co.uk are served by a Nginx server. The website does not specify details about the inclusion of its content in search engines. For this reason the content will be included by search engines.